Although they are one of the last things to be considered in the search for auto shipping and transport companies, making sure that you have a clear idea of what is included in your auto shipping contracts is a critical part of making sure your experience results in the successful and hassle-free transfer of your car from its origin to its destination, wherever that may be. 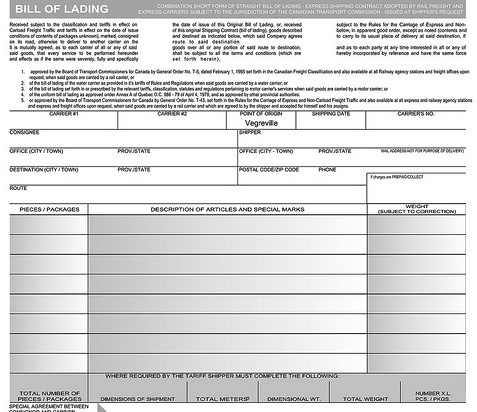 In the car shipping industry, contract details and information are listed on the bill of lading, a document that must provide a description of the type of delivery method used, the name and contact information of the shipper, and the condition of the vehicle upon pick-up and delivery, among other things Inflatable Boats. When selecting your auto transport company, you should have detailed discussions with the sales representative from each company you are considering, and take notes on what options and features are offered to you over the course of that discussion. Make it known that you are talking to more than one company, and, when you have finally picked the one that offers the best price and list of services, you can refer back to those notes to make sure that everything you have discussed is included in the contract you are given by the auto transport company. A mistake some consumers make when shipping their car is relying on verbal agreements such as: “Our insurance will cover that;” “Oh, transport will take seven days;” and so on. As a result, they then sign contract documents without reading through them carefully. It can be difficult to read an auto shipping contract when you are in a sales office and feel pressured to sign quickly, but you’re about to entrust your car to an auto shipping company who you may not have had dealings with before. You cannot just sign the papers without reading the contract carefully. Make sure that every point you have covered in your discussions and agreed upon is part of the contract, and do not let a salesperson hurry you to sign the documents. Should anything happen – a late delivery or unanticipated complications – you want to know exactly what your rights are, what is covered by whose insurance, and how you go about obtaining compensation, discounts or rebates for late delivery. Whatever you’re feeling about your auto shipping company, make sure to get copies of the bill of lading when having your vehicle transported from one location to another. Without these documents available to present later on should a claim arise, a verbal agreement may not be found binding in the court of law. By opting to purchase car shipping services, you are also purchasing certain protections, and these should be set out in your auto shipping contracts.